Just because I want to stay fit and healthy, doesn’t mean I can’t enjoy rich, creamy soups. I’ve got the perfect recipe for you that you can make quickly and easily and that is sure to make your taste buds dance! I’ve always been fond of root vegetables, growing up in Norway we had them in abundance because they were some of the few things that would thrive in a cold climate. From beets and potatoes to turnips and kohlrabi – I have fond memories of them all and so happy to have learned they also provide tons of nutritional benefits. My body also loves carbohydrates and I find when eating these starchy vegetables, I thrive much better than when I eat bread, pasta or other more refined sources of carbs. 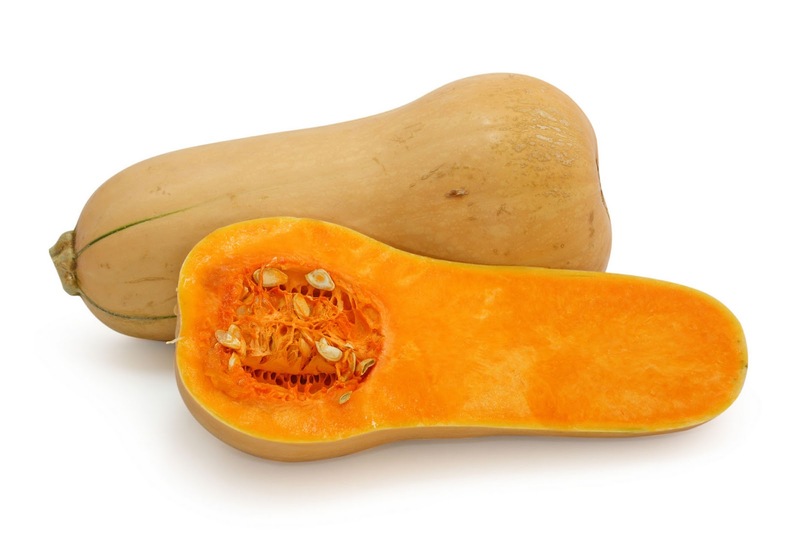 Butternut squash is one of the richest sources of plant based anti-inflammatory nutrients such as omega 3s and beta-carotene, which are important for a strong immune system to help protect against colds and flu. It is also an important anti-oxidant and provides a good amount of vitamin C, dietary fiber, vitamin B6, manganese, and copper as well as a good source of potassium, vitamin B2, folate, vitamin K, pantothenic acid, magnesium, and niacin. The seeds from butternut squash makes a great, nutritious snack as well, much like pumpkin seeds- just wash them and dry them, and roast in oven with a sprinkle of salt. Sprinkle on oatmeal, salads or just eat them on their own… delicious! While there are several ways to prepare butternut squash, one of my favorite ways is to make a silky, creamy soup. It warms me up during cold winter days and also fills me up with less calories. Try the below recipe for a nice twist on the traditional soup. Having a good blender is important in this process – I’m lucky to be the owner of a Vitamix and so the pureeing is done in no time. You can also use a stick blender. I chose to add some chickpeas for added protein to my soup, but you can use any beans or protein of your liking to the soup to make it more hearty. This is a perfect soup to make in big batches on a Sunday afternoon and you can portion it out and bring to work as lunch or heat up for dinner during busy weekdays. The soup also freezes beautifully. Preheat oven to 400F. Prepare a sheet tray with tin foil. Place the fresh herbs in the cavity of the two butternut squash halves, sprinkle with extra virgin olive oil (I use about 1 tbsp), and season generously with Kosher salt. Place cut side down on the sheet tray and place in oven on middle rack and roast for about 1 hour or until soft to the touch. Meanwhile, heat up vegetable stock in a pot and steep the fresh cilantro in the stock. Heat the coconut oil in a large saute pan over medium high heat, add onions and garlic and season withs alt. Saute for about 10 minutes or until soft. Set aside. When butternut squash is ready, let cool for just a little bit until cool enough to handle. Scoop the flesh out of the skin and chop up into big chunks, and discard herbs in cavity. Remove cilantro bunch from the vegetable stock and discard. In a blender, in batches, add some butternut squash and the onion -garlic mix along with the fresh ginger and a couple of ladles of the vegetable stock and puree. Add the batches to a soup pot until all done. 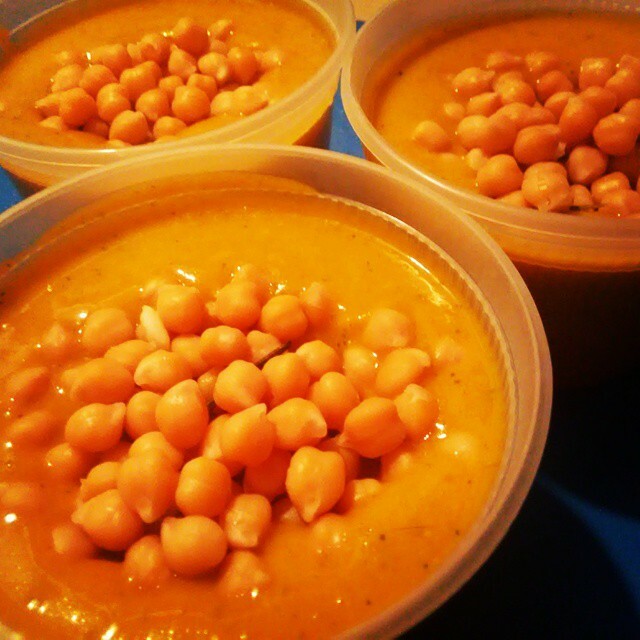 Heat the butternut soup gently over medium-low heat and add the coconut milk and chickpeas and combine and mix well until heated through. Season to taste with salt and pepper. Garnish with fresh cilantro.